BMF GROUP offers suitable services, depending on the complexity, policy and the needs of the organization. Telecommunications – innovative and integrated services: protection of intellectual property, the communication network security, security of people and their properties. Transports – BMF GROUP ensures a high level of protection within the system of public and private transport. 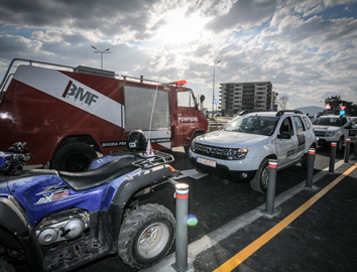 Culture – BMF GROUP provides security services for various events and for the protection of cultural properties. Residential areas – BMF GROUP provides protection services, additionally to the existing ones, in the residential areas. Education – In the current situation, the safety of children should be a priority in the school premises, BMF GROUP teams are trained to provide protection in any situation. Trade – BMF GROUP operates mainly in this field of activity, as the financial losses caused by security problems are at a very high level, because of the thefts of goods.